The demand for enterprise application development outstrips its supply by five to one as per Gartner. In one of our previous blogs, we have discussed how enterprises are utilizing external or remote app development workforce to cope with the growing challenges. This gap between demand and supply is a matter of concern not just for enterprises, but also for technology companies entrusted with the job of technology development, deployment and support. Going beyond, you shouldn’t forget the ROI (return on investment) aspect. Information and Operations (I&O) leaders associated with an enterprise have to make sure the developed product is deployed successfully at the premise or over the cloud, integrated with its different business operations, and managed appropriately.Superficially, they are various processes, but they all are interconnected. End users, that is, employees or their departments can earn the warranted business value propositions of technology when all these processes are carried out with absolute syn and collaboration. Here comes the significance of DevOps that aims at speeding up the process of application development, testing, integration, deployment, and management of enterprise applications with their automation and 360-degree monitoring. Thus, adopting DevOps in letter and spirit, enterprises can free themselves from the clutches of a myriad of IT challenges related to development, integration, performance and their management, and focus better on product innovation, delivery and customer-satisfaction to stay ahead of the competition. As enterprises embrace new challenges and embark on grabbing new opportunities, they are in dire need to make their delivery and operation agile, reliable and stable, resultantly, the adoption of DevOps has increased. Forrester observes that healthcare, banking, insurance, and manufacturing sectors are leading the charge, while others are gradually picking up with the momentum. In this regard, it’s worth noticing what 2017 Q1 Global DevOps Benchmark Online Survey (based on the opinions of 237 DevOps professionals) says. Though the current adoption is not much encouraging, being pegged at 13%, the outlook is bright. 50% of the companies have implemented DevOps, and are on the verge of expanding it further. 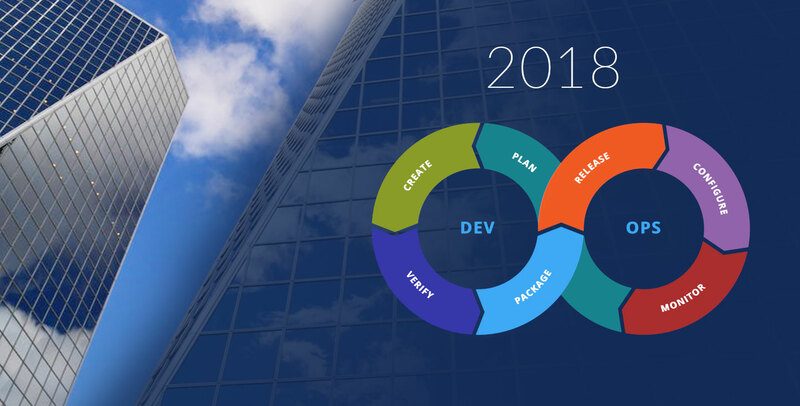 The interpretation of the research reveals that product lifecycle automation gained with DevOps across continuous integration, continuous delivery, and production deployment has given an edge to their owners. One the one hand, it helps with reducing the TCO (Total Cost of Ownership) budget, while on the other, it ensures diminished IT downtime or increased uptime. Hence, purposeful end-to-end automation is directly proportional to the business outcomes. What makes DevOps a huge success? Interestingly, it’s nothing, but its capability to overcome the silos of automation that helps with identifying, isolating and predicting issues before they surface. Besides imparting agility, stability and reliability, continuous delivery and release automation solutions offered by DevOps help businesses to do away with the need for change management. DevOps can automatically take care of the health of every IT piece from end-user applications to operating systems to devices in use. Thus, DevOps has significantly reduced the challenges for I&O pros, who were earlier relying on traditional or manual change management practices to keep their IT assets up and running. Intelligence is an innate element of DevOps. Or, you can say that it’s a self-assessment tool as well. It uses metrics to understand how DevOps practices and tools are working, and what impediments are there. So IT decision-makers of an enterprise can optimize the performance of DevOps tools, bring incremental enhancement to the DevOps practices and, overall evaluate the worth of DevOps itself. As DevOps is up to embrace challenges and help enterprises become more efficient, stable, profitable, resilient, it’s essential for entrepreneurs to be on its bandwagon. However, DevOps engineers need to make sure that the practices, tools, and changes map to the more significant initiatives at the business level and make it move forward with a competitive differentiation.